I’ve previously written about why you need an editorial calendar if you want to see results from blogging and save time in the long run, now I want to share how I set up my posting schedule and how you can create an editorial calendar of your own. Get super familiar with what you want your blog to be about; work out what topics, features, categories, and series you want to feature. Form a clear idea of what your blog is about, who it’s for, and the reasons why you blog. Knowing these things will help you stay focused and dedicated to blogging. Use a planner or make your own DIY blog planner to write down blog post ideas by topic and list any series or features you want to create. You might want to post daily, but is that a realistic expectation? It’s best to commit to posting once or twice a week and build up from there; increase your posting schedule incrementally so you don’t feel overwhelmed and you can manage the extra workload. Finding the time to blog can be tough. Use the editorial calendar to transition into daily blogging, if that’s what you’re aiming for. 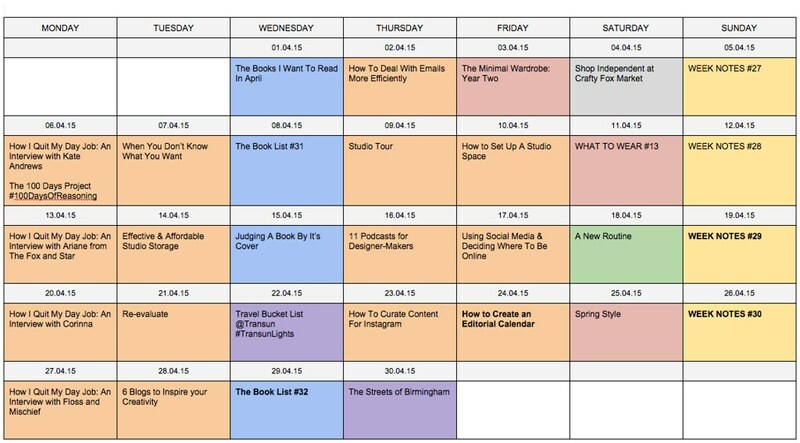 Once you have decided on publishing schedule you’re confident you can stick to, decide how often you want to create content for specific topics and features. The frequency of content topics will vary depending on what your blog is about and how niche your market is. Decide on the categories your blog will cover and how frequently you want to post about them. My blog encompasses quite a large range of topics but not all of them are featured as prominently. I reserve four days a week to creative content while travel is posted on an 'as-and-when' basis. Allocate specific content to days of the week or even month means readers know what to expect and when. If they’re not interested in fashion or lifestyle posts, they know to skip reading your blog on specific days and if they’re really into catching up on a series you’re running, they know what to look forward to. I post creative content on four days of the week, book posts go live on Wednesdays, and the weekends are reserved for features like What to Wear and Shop Independent, on Sundays I tend to post Week Notes, which is lifestyle content. I move the editorial calendar around to accommodate posts that occur less regularly such as travel, beauty, and fashion posts, and PR features. Knowing which days readers are most active on your blog is a useful insight that can be used to build your editorial calendar. If you’re been blogging a while, use Google Analytics to tweak your editorial calendar and make the best out of traffic. 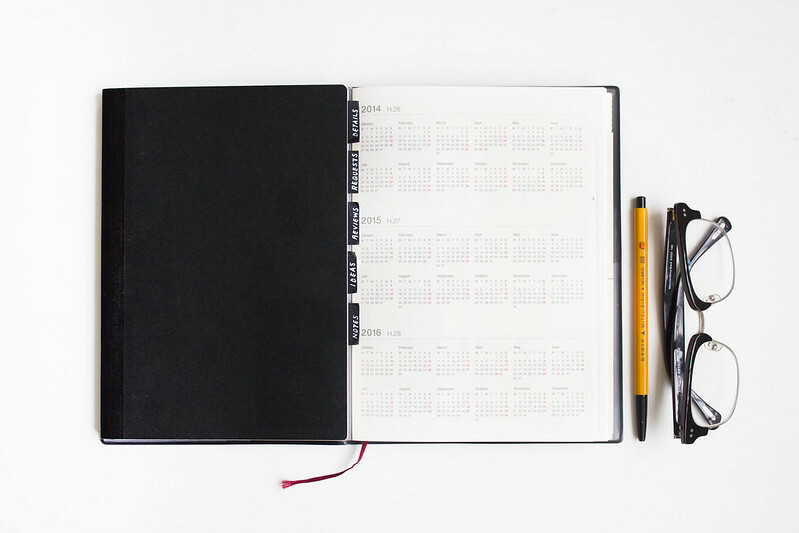 Find the right editorial calendar for you; whether you use a printable, handwritten version, a digital calendar, or a simple word document, you need something that is easy to use and that makes sense to you and the way you work. Your editorial calendar could include everything from social media prompts, keywords, permalink information, and other additional details - make it as minimal or as complex as you like. I use a really basic Google Document made from a simple table, it’s nothing pretty but it compliments the way I work. I colour code sections, assign post titles to days and dates, and unbold them when the post is written up and scheduled. Everything else I do in a blog planner, Evernote, and a corresponding social media calendar. Once you have your goals lined up, a realistic schedule set, and a weekly overview, you can start filling in the specifics. Assign post ideas to specific days and start mapping out your content on a monthly scale. Remember: you can move the content around freely, assigning posts to days doesn’t mean anything is set in stone or that all spontaneity is destroyed. Don’t be afraid of moving your content around, even at the very last minute before publishing.